PlayStation 3 owners haven't had the most support from Valve, and the developer says that it wants to make it up them. After a less-than-stellar version of the Orange Box and the complete absence of the Left 4 Dead games, it's safe to say that PS3 owners got a bit of a raw deal from Valve. The studio said that it didn't feel like it could deliver the kind of experiences that PS3 owners deserved, so it until it could put together a dedicated team, the PS3 would remain Valve-less. 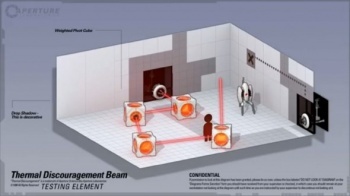 All that changed at E3 in June however, when Portal 2 was announced for the console, and it seems that that is just the beginning. Erik Johnson, a project manager for Valve, says the studio is keen to make it all up to PS3 owners, and that Steamworks - which was announced alongside Portal 2 - would be a big part of that. "PS3 is incredibly important to us," he said. "We don't feel that the PS3 users had the Valve experience that we like to deliver ... so in that case it's incredibly important to us [that] we kind of fix everything wrong in the products that we delivered before for the PS3, which we thought were good but weren't quite the Valve experience." It's a little tricky to square away Valve's new attitude with its previous comments about the PS3, but even when Gabe Newell was calling the machine a "waste of time," it was the case that Valve was worried about doing a good job on the console. If Steamworks allows Valve to do that, then it's hard to see a downside.